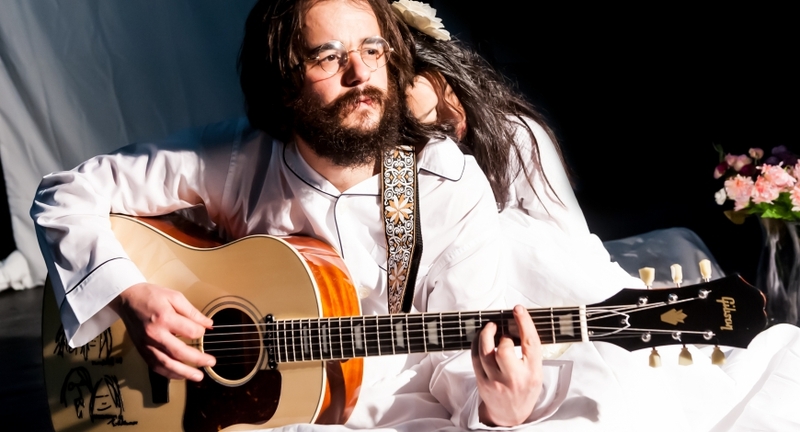 Craft Theatre are delighted to present the premier of their new work “Bed Peace: The Battle of Yohn and Joko”, a show which in 2019 marks the 50 year anniversary of John Lennon and Yoko Ono’s famous bed-in for peace; when the Lennons took over a hotel room, campaigned for peace and sparked a movement. The 60s are often remembered as a time of peace but the conflict experienced in that decade was immense. It was a time of loss of peaceful heroes, with icons such as Martin Luther King killed the previous year. As the Vietnam War raged in 1969, John and Yoko held their two, week-long bed-ins intended as a non violent protest against war and violence, and as experimental tests of new ways to promote peace. Now in “Bed Peace: The Battle of Yohn and Joko”, Craft Theatre bring John Lennon-esque wit, fire and honesty, and Yoko Ono-esque spirituality, philosophy and mystery, plus ensemble story-telling, physical theatre and live music to help bring to life once more, the energy of 1969 and the Lennons’ mission to bring peace to the world. This devised piece, set intimately in the round, captures these seminal protagonists; an artist’s impression of a snapshot of that unique time, and that unique relationship. Recreating 1969, via the use of both verbatim and imagined script and creating a vehicle for audiences to experience this reality, Bed Peace is an exploration of the power of peaceful protest, of the power of art as protest and of the circumstances that lead to the creation of some of the most important music of our time. Bringing Lennon to life with all of his flaws and all of his humanity; this is an imagination of the experience of one of the most influential men in recent history and one of the most captivating relationships of the modern era. Who were John and Yoko when the cameras went away? How did they interact? How did they cope with the pressure of being so in the public eye? What happened in their private moments? What made John Lennon the way he was? What happened inside of them and between them at this specific and vital time? How did they cope with public placing them on a dangerous pedestal, set against the media’s attempts to discredit them at every turn? Creating performance art as a political statement had never been done on this scale, and while as a protest it may have been seen as ineffectual at the time – wars continued, peace did not win out – as a work of art it has endured; and more than that it has become an inspiration for myriad political protests that have gone after it. John and Yoko’s seminal art war protest has become a catalyst for more than they could ever have realised. The song Imagine written shortly after the experiment; it was the best-selling single of John Lennon’s solo career, its lyrics encouraging the listener to imagine a world at peace without the barriers of borders or the divisions of religion and nationality and to consider the possibility that the whole of humanity would live unattached to material possessions. A message we could all do well to heed now.